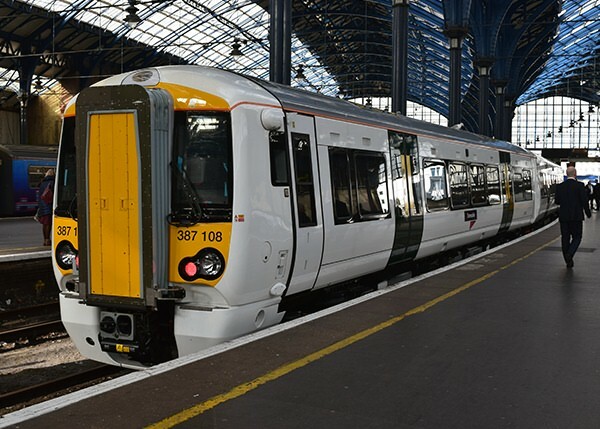 For the un-initiated Bombardier Class 387/1 units are 4 car 110mph capable dual voltage/pickup new-generation Electrostar trains being introduced as a stop-gap measure to allow Thameslink Class 319 units to be redeployed prior to sufficient Siemens Class 700 units being delivered and commissioned. The class is then due to be transferred to other services, several have been mentioned but First Great Western London local services are the current thought. (If they run as far as Newbury the SEG Webmaster will be very pleased!) They are externally similar to Class 377/6 &/7 units but they cannot work with any type of Class 377 unit except for rescue purposes. Following a slowish start they are now emerging from Derby regularly, being commissioned for ac workings on the West Coast mainline and for dc workings to Brighton. 387105 and 106 were first out on ac trials on 3rd November, and on dc trials the next day. 387107 ac trials from 6th November, dc from 11th November. 109 has now started both ac and too. 387103/111-120 are all at Derby now fully built with 387121-123 at various points on the assembly line. By the end of February all units should be built and the last few out on test. New GTR Thameslink branding has been added to 387105/106/107/108 at Bletchley. 387105 and 106 were then delivered to Lovers Walk on 13th November and are now undergoing acceptance. 387107, 108 and 109 have followed since. 387101/102 & 104 are about to commence commissioning at Bletchley. It was planned to put some into passenger service on Brighton - Bedford services from 27th November but the Webmaster has yet to see confirmation (and details) that this happened. 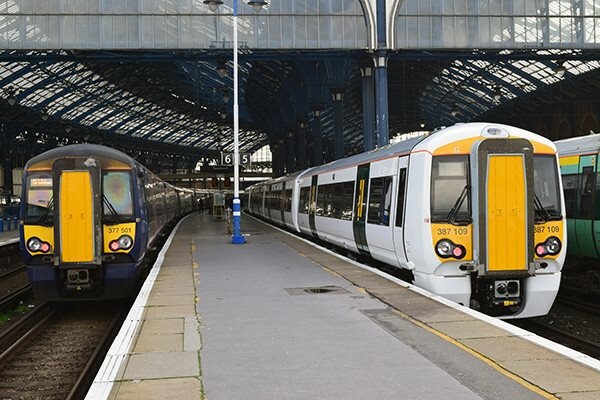 (below) "old" and "new" Thameslink Electrostars in adjacent platforms at Brighton on 19th November 2014. Note that 109 had yet to receive GTR Thameslink branding. photograph by "GB"
(above) 387108 at the buffer stops at Brighton on 19th November, with GTR Thameslink branding. 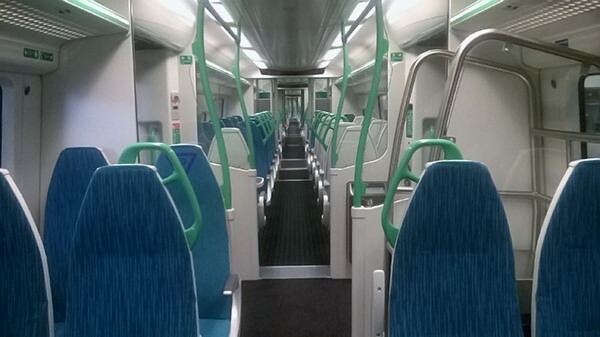 (below) The interior of a Class 387/1 unit, similar (but not identical) to that in Classes 377/6 &/7. 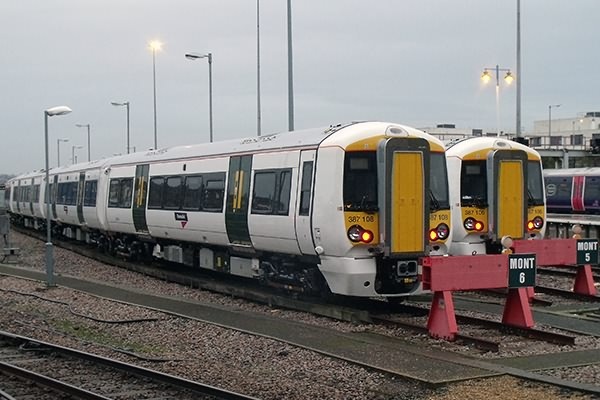 Govia have now ordered 108 cars worth of Class 387/2 units (twenty seven 4 car units) to replace Class 442 units on Gatwick Express and certain Victoria-Gatwick Airport-Brighton services. These will, of course, have additional luggage facilities and will at least stay on the conductor rail even if the 387/1s eventually depart.